Though the beginning was small, things ended up much bigger than expected for fashion designer Paul Smith. It sometimes is still hard for the designer to believe what he has achieved. The celebrated designer’s first store in Nottingham, which opened in 1976, was 9 square meters. It was only open Fridays and Saturdays, as he had to work another job the rest of the week to make his living. Seven years after opening the shop, Smith went to Paris with a small collection of clothes. But he didn’t have enough money for a fashion show or showroom. Instead, he turned his small hotel room into a makeshift showroom. Yet no one came until the very last day. “On Thursday at 4 p.m., one person came. That was the beginning of all this,” Smith said. Now a global company with locations in 73 countries, Smith has become one of the most successful designers in fashion history. “The most important thing is to find the balance between high fashion and everyday fashion. Many fashion designers have either very commercial clothes or very niche high fashion,” Smith said, dressed in a navy check-pattern suit with his signature eyeglasses. This again shows that the label reflects the designer’s philosophy. It is not cheap, of course, but boasts high-quality with fine fabric. It is not super high-end. It is somewhere in the middle. The label is known for its well-tailored yet stylish suits for men and women alike. “Many people wear suits because it’s like a uniform. It’s a symbol of importance and power -- not everybody. Our suits are constructed, made in a very soft way. They are very relaxed, the fabric itself, also the way inside, we have something very soft inside. Not big pad -- it is very easy to wear,” he said. Paul Smith suits are formal, yet casual. While the cut is sharp, the overall shape is fluid. Also, the designer is famed for his wide spectrum of color. “Maybe one of my specialties was tailoring. I learned how to make a suit. Paul Smith tailoring is very unusual, while commercial tailoring is very stiff and rigid,” he said. “Now we have a big success of suit: fabric choice, interesting color and lining, (construction) softness and the cut, the shape,” he said. Stripes cannot be left out when talking about Paul Smith. The iconic color stripe defines the Paul Smith label, transcending color or pattern. “It was really an accident. I just used the stripe for one season, and the next time, all the buyers asked me, ‘Where is the stripe?’ They demanded, I have to bring it back,” he recounted. Until this day the stripe has continued, symbolizing the brand and the designer. The established designer is all about being independent. Even after more than 50 years of success, the Paul Smith label is still an independent firm, not affiliated with any big fashion corporations. “Fashion is about trends. For Paul Smith, it is more about individuality. 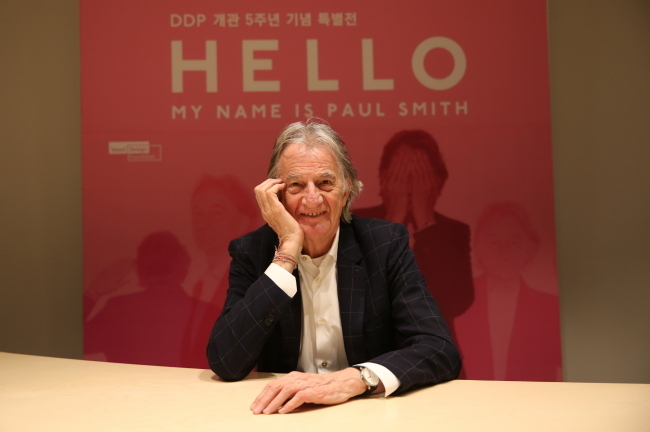 Paul Smith is still an independent company. (Being in a large firm) means that your creativity can be contained,” he said.